An up-to-date reference on fiber optic design for the contractor, installer, designer, project manager, facilities manager and user. The purpose of this book is to provide a reference guide to those involved with the design of fiber optic networks or those teaching the personnel who will do this work. This book is also the reference guide for FOA CFOS/D Design Specialist certification. As defined here, a fiber optic network is a communications system that operates over fiber optics, but is likely to also include copper cabling and wireless. With a subject so broad, it’s impossible to cover every aspect of the topic in depth. What will be covered in this book is primarily the basics of design of both premises and outside plant fiber optic cabling to support practically all types of communications systems. It is assumed that the reader is familiar with basic fiber optic technology used for premises and outside plant networks at the level of a CFOT. 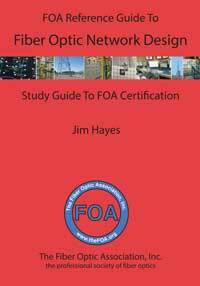 If not, you should begin by studying general fiber optics using Chapter 2 - Jargon in this book, the other FOA textbooks, FOA Online Guide (www.foaguide.org) or take the basic self-study course at Fiber U (www.fiberu.org). The Fiber Optic Association, Inc., the nonprofit professional society of fiber optics, has become one of the principal sources of technical information, training curriculum and certifications for the cabling industry. The new FOA book uses state-of-the-art "publish on demand" technology where the book is printed when you order it using the latest printing technology. This new technology is less expensive than conventional publishing plus the cost of inventory is no longer an issue. We can also update the book easily to keep up with new technology, applications, and FOA programs. And using a web ordering and delivery system saves even more costs associated with the overhead and distribution of a conventional publisher. The FOA, a real non-profit organization working for the good of the industry, is passing these savings directly on to you! Jim Hayes, current FOA President, has over 35 years experience in the fiber optic communications industry as an technologist, entrepreneur and trainer. He is a co-founder of the FOA, author of 8 textbooks on fiber optics and cabling and a columnist for several trade magazines.